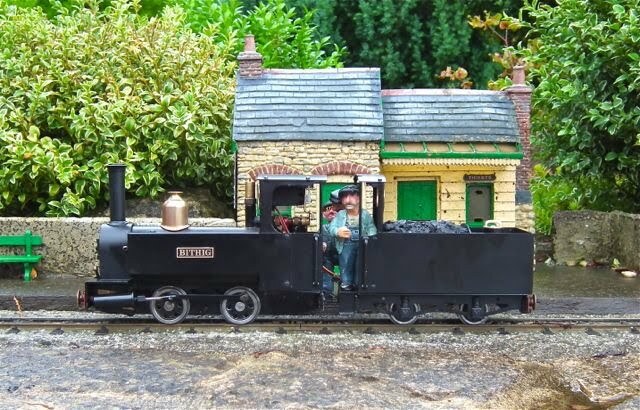 Like many folk, I got into garden railways via a Mamod loco. Mine was a kit, spotted at a toy fair in 1983, and I just couldn't resist it. It was quickly built and just as quickly, I realised that it was far from ideal! It needed "Mamodification". I made myself a new meths burner, but the speed was just too much for my tight curves (Mamod track of course) and I was pretty disappointed. The I spotted a series of articles by Fred Game in a magazine called Model Trains. Radio control was the answer and all I had to do was build a tender on a Mamod flat wagon chassis, and then fit a 27 mhz receiver with a servo in the cab working the reverser via a bell crank. Simple I thought, and with a few handrails and a coat of Alfa Romeo red cellulose, I had it sorted. Yes, it looked a bit odd, and the colour was a bit bright - but this was 1983! Those who have "been there and done that" will know what happened next. It was truly appalling! It glitched on every rail joint and had all the sublty of a dragster! 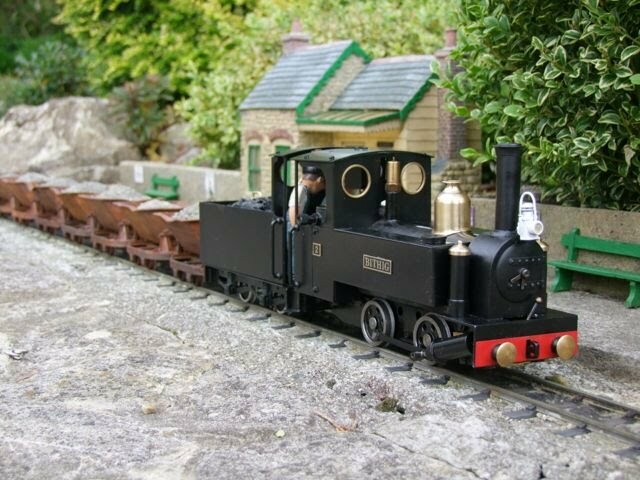 I moved on to building a loco from a box of Merlin parts and the Mamod was placed out of sight until it was stripped and rebuilt a couple of years later as "Lizzie" (seen here running as a 7/8ths scale Heywood type loco). In fact, I was cured of radio control until the appearance of 2.4 ghz. But clearly I wasn't cured of Mamods as when (about 25 years later) I was offered one with IP Jane boiler and cylinders, I couldn't resist. It was the same SL1 kit, but after converting it from 45mm gauge to 32mm, I found that its character was pretty much the same! And so it was back in the cupboard until Roy Wood started talking about Mamods and PPS Janets and I remembered that I had bought a second hand gas tank and burner which might fit. So I tried it, and then rebuilt the burner with nichrome mesh. After various failer attempts it worked and glowed red to give radient heat as well. But there was no room for the gas tank which had a rather long pipe and a big bracket. Also the lubricator took up lots of space in the cab. The photo shows the original lubricator, but the new one was in the same place. Then I remembered the red tender and thought ah - the tank could go in that I thought, and it might not need a hot water tank....... Here are the bits that I kept in case they came in useful. Well, of course, the tank cooled and the burner didn't heat the water. And when it did, with the help of a jug of hot water poured over it, there were so many steam leaks that I knew I was wasting my time (again!). I had no option but to tackle it properly (rather than just dabbling in the odd moment) so I stripped the loco and purchased a PPS type reverser and a new PPS type lubricator from Roy Wood Models. This allowed me to re-route it in the cab and make room for the gas tank with a shortened pipe. Here they are just tried in position until I can make a bracket for the tank. A test showed it worked superbly and the radient burner worked so well that the loco got VERY hot, even with it turned right down! The PPS reverser worked like magic and the absence of leaks appeared to double the power. The wind-out type regulator took it from stop to racing in about a quarter of a turn so my mind has turned to radio control on the regulator only, and that meant that the tender has a use. The problem with the high pressure boilers is that there is no dome - and I think that a Mamod needs a dome. I had a Roundhouse Bertie one in stock and so I turned a new top and an adapter to make it sit over the Goodall filler. I annealed the brass and swaged the edge down to fit the smaller boiler before silver soldering the parts together. I followed the method that I had used in 1983 for the chimney cap. I sliced off the rim with a razor saw and turned up a cap to fit. This is a press fot in the chimney and looks a bit better than my 1983 one! Then I etch primed it with Upol Acid Etch 8 after rubbing down and de-greasing with thinners. And after a quick bake at 80 degrees C, I sprayed it all with Halfords Satin Black. I then moved on to the steel body. Luckily I had some old stock paint stripper so I didn't have to wait too long. It was interesting to find just how much rust was under the paint! There were lightly rubbed down and boiled for a while in diet cola (rich in phosphoric acid) to neutralise the rust. Then they were primed (I used etch but it was not necessary) and sprayed satin black. I had originally thought that I would just leave the chassis 'as is' but I was on a roll and so decided to dismantle and strip it. The frames are pretty thin and a bit pitted, but I reckoned the gaskets would cope with the pits. They were rubbed down, degreased and primed before spraying satin black. I did think of making cylinder covers, but then I decided that this was going to be a proud Mamod, with cylinders showing - but in a discrete black. I degreased them, rubbed them with fine wet and dry (400), etched and sprayed them satin black. I did the same with the back plates and brass coupling rods. I would love to say that this went smoothly, as after all, I had built one of these locos in 1983 and had just stripped this one. I even tidied a part of my workbench so that I had space. The first thing that happened was that the flourescent over my workbench tube began to fail just as I started. On - off, on -off. I tried to ignore it and carried on. And here it is with them. Amazingly I did not fire any of the circlips across the garage....! I had a huge struggle fitting the cab to the firebox, as the water gauge glass is in the way. I was concentrating so hard that when I finally managed it and stood back to admire it.....I realised that the cab was in front of the safety valve instead of behind it. Grrrr....! Mating the boiler to the chassis was pretty easy and I quickly fitted the burner in position and added to gas tank. For this I made up a bracket to fit using the screws for the cab side extension. Here is the bracket with the one for the servo. Both made from brass. I tapped both 8 BA and used small headed bolts to fit the (with washers as the holes in the side platework were for 6 BA). At this stage, I also e-fitted the Summerlands Chuffer. I was well pleased with the tank fitting - until I came to fit the steam pipe and realised that the gas pipe was in the way. I removed the tank and fitted the steam pipe/lubricator. I also siliconed a small piece of brass with red diagonal lines behind the water gauge to make it more visible. While the boiler was off, I had taken the glass out and cleaned it. The silicone tube washers looked OK so I put them back. I should have realised by now that I should check and double check at every stage - but no, I was confident that all would be well. So I pressed on a fitted the left hand cab extender and the roof. I had huge problems using the 8 BA bolts as I just couldn't get the nuts to mate with them. I kept dropping them and vaseline on the finger and needle nosed pliers didn't help. I ended up using long bolts and then cropping them short when the nut had been tightened. Here is the loco with the servo in place - stuck to the bracket with an exterior Sellotape pad. The control rod is crude but works. The regulator handle is the original boss with a brass plate silver soldered on. I had lost the will to paint things black when I got to the lubricator, but with all put together, I did go round and touched up all of the bolt heads with black paint. And here is the loco posing before testing - it is indoors as it was hissing with rain outside. I tested the radio control (a super cheap one from Radio Link) and after a few false starts , all seemed well. I put the loco on my Hog Hill rolling road and added oil, water and gas for the triumphant test. Ah - well - all did not go quite to plan. The first problem was spectacular. Somehow the steam pipe had become unseated (it is a push fit in the reverser block) and so when the regulator opened, it blew all the steam oil out , which then caught fire in a spectacular way! STOP! Cooled it down and pushed the steam pipe back into its seat. Now as it came up to pressure, steam seemed to be issuing from every joint in the cab! It was coming from the top of the water gauge, from the gland nuts for the glass and from the regulator boss. I tightened them up - but to no avail. I returned to the bench at about 11.00pm, determined to sort it before I hit the sack. I had some silicone tube, but it was a bit small and try as I might, I just could not get it to slide over the glass. (Feed the tube in from the top, add seal, add gland nut, add second gland nut, add second seal and do it all up is the plan). After about ten attempts, I decided to make the end of the tube more 'friendly' and so heated it to red heat in a gas flame. It melted and rounded nicely. When cool, the seals slipped over easily. The problem now was that it was nearly midnight, the flourescent tube had failed completely, and the red wine had not improved my dexterity. One gland nut hit the floor, never to be seen again. By astonishing good luck though, I had a spare, and so all went back together before I retired for the night. The next day dawned with torrential rain as usual. I was not going to make the mistake of putting it all back together and painting my bolt heads before a proper test this time. So with it balanced back together, I prepared it and raised steam. The good news was that I had sorted all the leaks. The bad news was that it would barely run. Whereas before, 90 degrees on the regulator had it racing, now it would barely turn its wheels. On reflection, I realised that I had taken a beautifully run in loco and altered everything. It was no longer run in! So back to the bench to fiddle and fettle all the bolts until it felt OK and then steam and steam again until it would run well on the quarter regulator I needed (photo below shows the running in process). Then, and only then, did I bolt the gas tank cab extensions back in. Now I had to re-fit the roof and servo, with those difficult 8 BA shortened bolts. I gave up on the nuts and used two brass strips cut, drilled and tapped 8 BA. Phew! Then it was a case of test again on the rolling road as it was still raining outside. Wonder of wonders - it all worked! Then the rain stopped, so after clearing som debris from the track, I took it out for a run. When steam was raised, the gremlins struck again. The radio control just wouldn't work. The receiver was on and cool in the tender, the servo was clearly getting power, but nothing moved. I switched it off and sent it round on manual. Perfect! It ran so smoothly, unlike any Mamod I have seen. It just plodded, without the least attempt to stop on the gradients or run away. I confess I was astonished! I stopped it then and tried the radio control again. It worked - and was even better than I could have hoped. 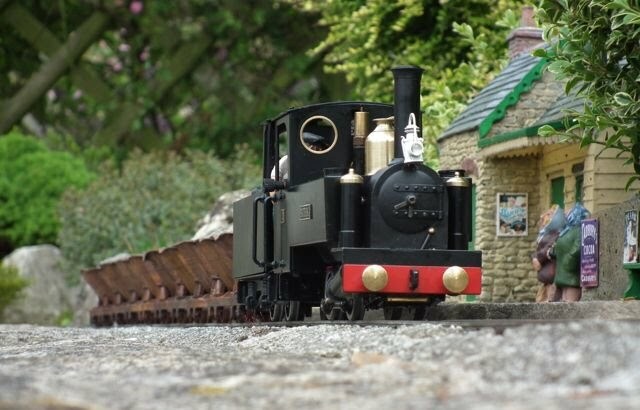 This project was never intended to be about fine modelling, or even about creating a credible looking loco, it was about nostalgia and paying tribute to the Mamod SL1 that got me into the hobby. Yes, it has a lot of modifications, but I purposely left those Mamod buffers and smokebox dart as they are part of the character. The same goes for the terrible handrails and my less-than-beautiful tender - I was proud of it 28 years ago (for a couple of days!) and it is great to see it finally working. It is early days yet, but the running yesterday was a revelation. With the right boiler (IP in this case though there are various available now), burner (home made), cylinders (PPS), reverser (PPS) and lubricator (PPS) it is transformed. Then with very careful fettling and running in, it became a fun and docile loco. 1. To replace all washers and seals on an old loco as a matter of course. 5. .To have spares handy if working late at night after red wine! I stripped the sand -boxes, polished the tops and masked these while I etched and sprayed them satin black. They are fitted with a 6 BA screw, but this is awkward with the cylinders in place and they have to be fitted after the smokebox is in place as the screws have to be accessed. I removed the smokebox and marked the position of the holes on the top. I centre punched these and then found that the chuck on my bench drill fouled the chimney, so I had to drill them with the hand held drill. This was a very bad idea, as in the soft alloy the dril wandered.... I didn't notice at the time as the rain had stopped and I was in a hurry to shoot a video, but later I spotted the glaring error. Anyway, I tapped the holes 6 BA and used a little piece of 6 BA stud in the bottom. Later, when I came to rectify the problem, I used a file to slot the holes and used screws (awkward but I managed!). The tank fillers were turned from brass, sprayed and fixed with silicone. I steamed up and cleared the condensate ready to film a nice start from the station. As I turned to the camera, the loco just quietly started and wandered past me - the regulator wasn't closing properly. In fact i watched in amazement as the loco plodded round the track at a scale walking pace, ignoring gradients and curves! I tried adjusting (bending) the control rod but it seemed to make no difference, so I settled for passing shots for the film. Later, when I had it on the bench I realised what the problem was. The boiler is not secured in the cab, and the servo was just lifting it rather than firmly closing the regulator. For the present, I have just wedged it, but I will need to find a better solution. Here it is - no trickery here, it really is this slow!